Do you have a wedding, corporate event or graduation party coming up? 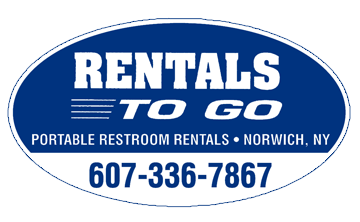 Rentals To Go has all of the event rentals you'll need to make your event in the New York state area a success. We have rentals just right for all kinds of events and situations. Whether you need portable toilets, shower trailers or golf carts, we've got you covered. We'll deliver the restroom and refrigeration trailers you need to make sure your guests have everything they need. Our event rentals are ideal for parties, disaster relief situations and music festivals. Contact us today to schedule event rentals. Rent restroom trailers for your next big event. We can drop off portable toilets at your location. We'll supply the shower facilities for your festival. We have 6- and 12-tap trailers available. I have rented several restroom trailers from this company. Jennifer is awesome to work with!! She has went over and above my expectations!! I had a need for a restroom trailer last minute for an event for one of my clients, and she made it happen!! It is not ideal to be ordering a restroom trailer the day before a wedding, but she made it happen!! Thanks guys!! Keep up the good work!!! Struggling With Septic Tank Issues? Copyright © 2019 Rentals To Go, all rights reserved.